Dr Julie Macpherson, of the Department of Chemistry, has just been awarded the title of Young Researcher of the Year 2005 in the Times Higher Awards. Congratulations Julie! At 32, Julie has already reached the level of reader, an achievement that one judge described as 'really extraordinary'. 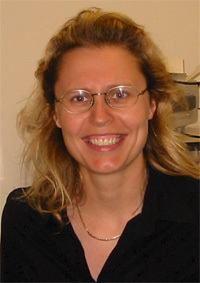 She has also secured a prestigious Royal Society research fellowship and a string of other awards. The panel pronounced Dr Macpherson a 'remarkable' scientist. Her work over the past decade has ranged from electrochemistry to scanning probe microscopy to interfacial science. But her nomination for this award focused on her recent contributions to science on the nanoscale, with 11 published papers in the past year. Her 'groundbreaking' and 'imaginative' research with singlewalled carbon nanotubes has made it possible to map the chemistry of surfaces at a molecular level. This advance has the potential to affect the work of thousands of researchers, with uses as diverse as the exploration of cell signalling and the detection of corrosion on aeroplanes. The judges agreed that as a young woman working at the cutting edge of an exciting new field, Dr Macpherson was 'a truly wonderful role model'. Members of her department describe her as one of their best lecturers. She believes strongly in the value of using research to enliven teaching, and the feedback from undergraduates on her modules is 'outstanding'. She has twice won the department's own prize for excellence in undergraduate teaching. Julie said: “I was delighted to win and completely shocked – I was shaking when I went up to receive the award. There are so many good people out there doing fantastic science. Nano-research has a high-profile at the moment and it’s a very exciting field to work in. “Our work finds new ways to look at things which are too small to examine using traditional techniques. Nowadays chemists are less likely to be using test-tubes and microscopes, and more likely to be looking at electro-chemistry by using laboratory-customised atomic force microscopes. Julie graduated from Warwick in 1999, with a top first-class honours degree and the ICI prize for her research. Despite her success at home and abroad – including offers from top US universities – she has chosen to stay at the University of Warwick.